To all clients - have a great holiday weekend! AHL will be on Statutory holiday / Sunday hours on Friday April 19th. Specimen Room will be open for receiving 9AM-5PM (sample drop off available 24/7). Saturday will be regular Saturday hours and services (Bacteriology and Clinical Pathology) and Sunday, as above for Sunday services again. Monday April 22 - AHL is open - business as usual. Our March 2019 AHL newsletter is now available under Publications-Newsletters. AHL Guelph is open today (February 13th) . University of Guelph is CLOSED today, February 12 2019, due to severe weather. Delays in reporting of test results may be expected as AHL has only a limited number of essential staff on site to deal with urgent and time-sensitive testing. Please address any inquiries to ahlinfo@uoguelph.ca. University of Guelph is CLOSED today, February 6 2019, due to severe weather. Delays in reporting of test results may be expected as AHL has only a limited number of essential staff on site to deal with urgent and time-sensitive testing. 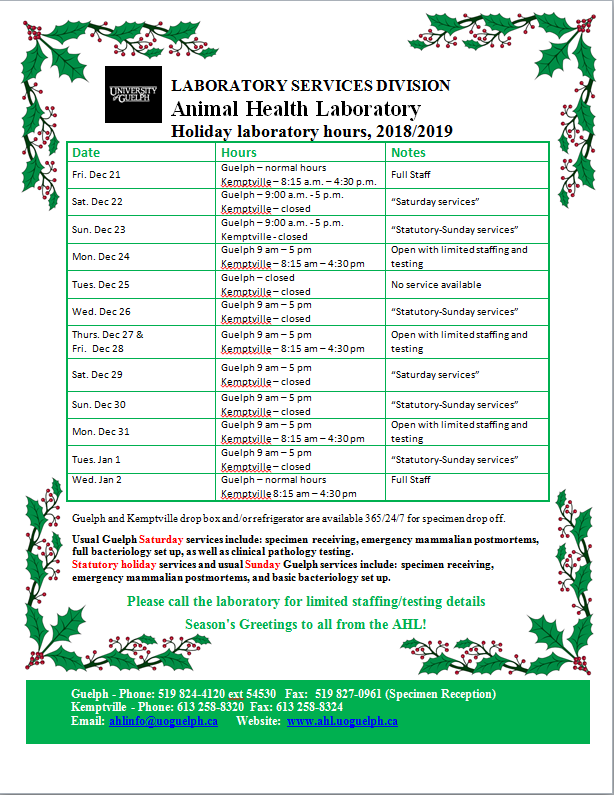 Our December 2018 AHL newsletter is now available under Publications-Newsletters. Temporary Campus wide phone interruption inbound/outbound for external calls.